Think about how students find information about the schools they’re going to opt for in the future. Whether we’re talking about high school students trying to locate the schools that offer majors of their choice, or if we’re thinking about students who could use an online learning program while working a full time or part time job. Sometimes college websites are merely for information, while other sites are built with huge infrastructures and online course functionality. 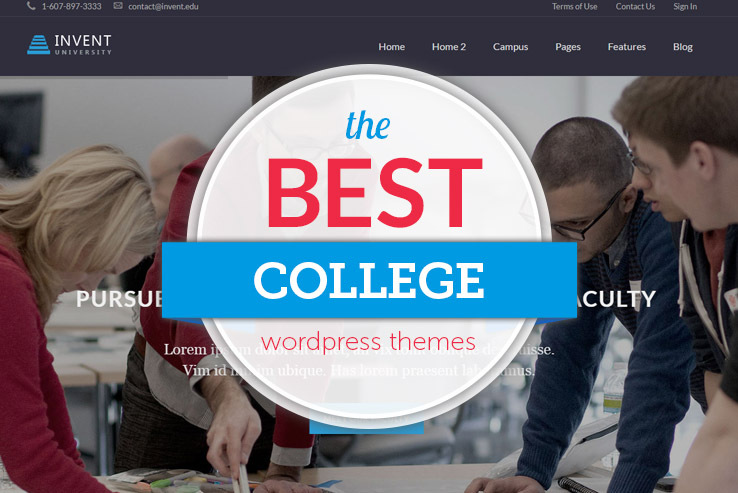 No matter what you go with, the best option to get started is a college WordPress theme. So many themes are designed every year, and some companies focus particularly on making themes for schools, colleges, and universities. They will help you structure your information and show potential students everything your campus has to offer. What should you be looking for from an education WordPress theme? To begin, it’s essential to have a beautiful responsive layout. The best themes combine nicely with plugins and other applications, and they are known to have quality developers who used clean code. The vast majority of them present courses in reasonable formats, using icons, links, and images. Post types are nice for customization, while drag and drop editors improve your development process. Since schools are constantly changing information on websites, a drag and drop editor is an easy way to do this. Since colleges have strong brands, it’s also crucial to have branding tools like logo uploads and unlimited colors. That way, you don’t get stuck with a color that “kind of” looks like your logo. Along with localization for reaching foreign students and galleries for showing your campus to potential students, the features in the themes below are pivotal for keeping enrollment rates high. The Grand college WordPress theme is a solid choice for getting started, considering it provides a beautiful course table built right into the system. This way, you can present all of your courses in a reasonable format, all without having to touch the source code for customization. The personnel post type provides an interesting solution for featuring people working for the college. Many people are going to make their school decisions based on the quality of your teachers. Therefore, we recommend talking about where all of the teachers came from, while also posting pictures and biographies for each person. The drag-and-drop page builder strengthens the way you display information on your site. With elements for building your website, you don’t ever have to touch a line of code for finding the ideal setup. Localization is included with the theme and six custom post types further expedite the process for you. Unlimited sidebars are rather impressive, considering lots of widgets can go right on the sidebars. Feel free to upload a logo for your website from the backend and customize colors without any problems. A search bar resides on the top of your page, while social media buttons are included so that you don’t have to go out and grab a third-party plugin that does the same thing. Shortcodes are there for typography, drop caps, and more, while the slider at the top of the site includes images, descriptions, and buttons for sending users to other parts of your site. The entire homepage is mainly constructed with widgets and drag and drop elements. One of the elements is used for students who want to search for courses by course name, instructor or room number. A contact form can be implemented in some of the widget areas, which is ideal for giving students a way to contact your college. The blog is pretty standard, but it improves your chances of moving up in the search engines, while also providing an easy way for potential students to view your knowledge base. The portfolio and gallery section are great for sharing images from around the campus. 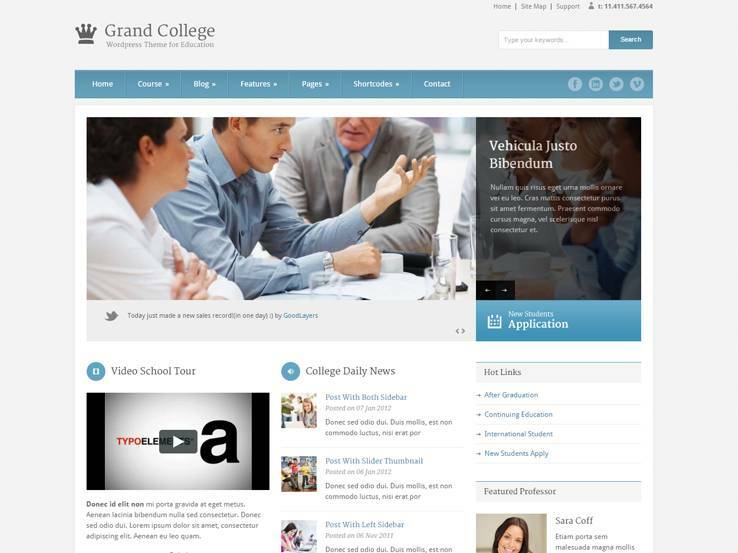 Along with contact information listed at the top and a completely responsive website, the Grand college WordPress theme has exactly what you need for a college website. 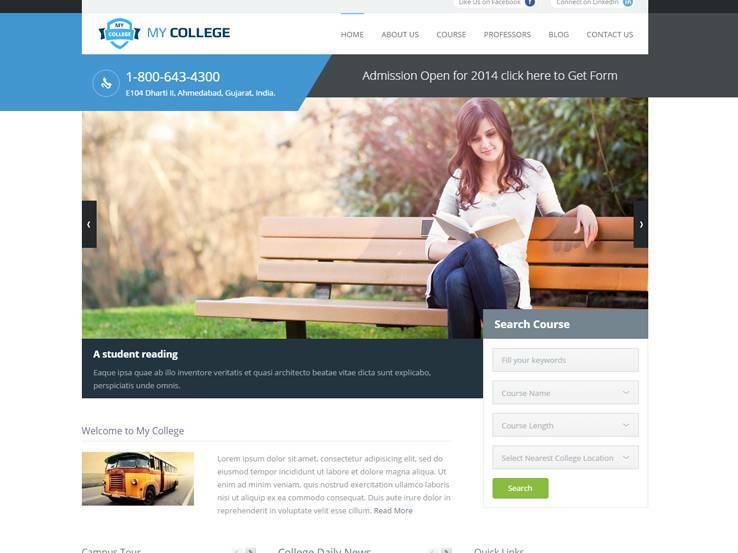 The My College WordPress theme is a premium education theme with three color styles. It’s not that great for branding, but it has a beautiful interface, which is nice for smaller colleges and institutions that focus on just a few areas. The responsive design makes it easy for students to check in on their assignments and courses even while they are on the go. Touch and swipe functionality combines well with the responsive design so mobile visitors can easily scroll through the information you post. The extensive documentation is one of the best we’ve seen and the support team ensures that you can solve problems if they ever arise. Localization is allowed through the My College WordPress theme, which is more powerful than you might assume. If you have a college that’s in a more culturally diverse area or if you want to cater to students from other countries, you can easily translate your website and allow those students to view the information in their own language. 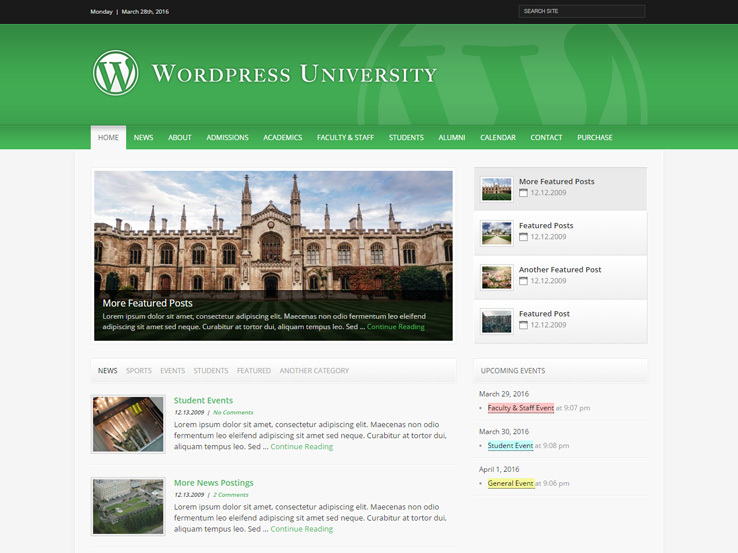 The modern layout of this WordPress theme delivers a decent option for colleges that provide majors for more technical students. That said, you can pretty much use the theme for any type of school. Social media buttons are included with the theme, while a myriad of slider options display information about your school, but through a more visual interface. All of your contact information can reside towards the top of the website and an entire blog gives you the tools needed to share updates about enrollments and events. Students can search for courses using keywords and names, while the campus events are managed through a beautiful calendar. A newsletter signup form builds your email list and it removes the need to go out and find a separate plugin that’s only going to slow your site down. A Twitter feed is great for keeping students updated about recent news. The page for professor information is rather nice, considering you can display photos, descriptions, and links to more information. Overall, the My College WordPress theme is one of the sleekest we’ve seen, so give it a try and let us know what you think. If you’re looking for a theme that helps with developing online education centers, this isn’t a bad choice. 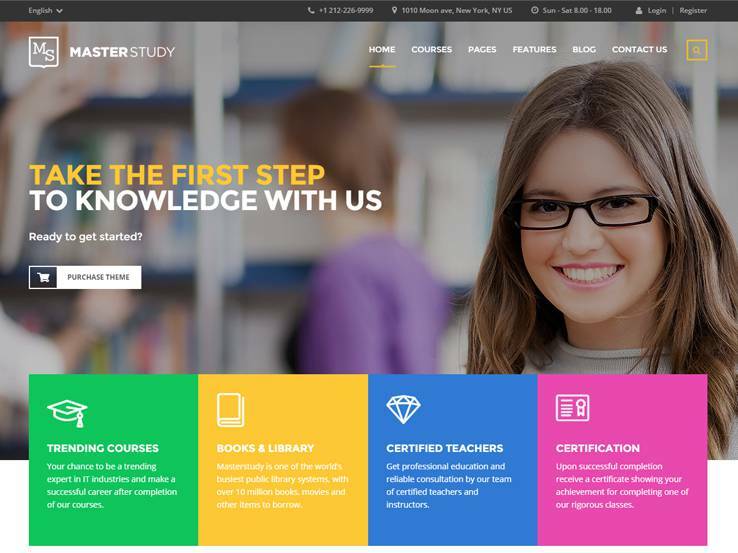 The Masterstudy WordPress theme also works wonders for independent tutors. The whole point is to generate great courses in minutes, so you can develop all of the classes from the backend of the WordPress website. Feel free to give away some of your courses, but also make money by selling courses and connecting these transactions to your favorite payment processor. The best way to do this is by setting your prices and products with the WooCommerce plugin. After that, connect through PayPal for your transaction payments to drop right into your account. Two header options get you started on the right track for branding. I particularly enjoy that you can collect reviews and ratings for all of your courses. This way, students can see which courses are most popular. On the other hand, this system also allows you to cut out the courses that people don’t like. All learning communities show interest in the teachers who are going to run each course. Therefore, the Masterstudy WordPress theme incorporates a teacher profile with images, descriptions, and qualifications for each of your staff members. The template provided is ideal so that you don’t have to develop a profile for each person. Four skin presets offer a little bit of variety throughout your site, while the one-click demo import boosts the speed of your entire development process. We particularly enjoy that the Visual Composer and Revolution Slider plugins come for free with your purchase. These are both premium plugins. The Visual Composer plugin has a drag-and-drop interface, while the Revolution Slider plugin has what you need for posting high-resolution images in a slideshow. The theme is completely responsive and the localization support is great for reaching out to new people. Over 700 Google Fonts improve upon your already solid branding strategy and custom sidebars and widgets help to round out a rather awesome college WordPress theme. University comes from TemplateMonster and it features a modern and responsive design that’s sure to make a lasting impression on anyone looking to invest in higher education. The homepage has plenty of space to display information about various programs and degrees you offer and you can also include your location and contact information so potential students can easily inquire about your enrollment process. Use the blog section to keep future students up to date on class assessments and easily create a page for most frequently asked questions. You can also easily add testimonials to build credibility and include several social media icons to link to your social media profiles. The theme is fully editable on the backend which makes customizing a breeze and various custom post types allow you to create posts containing galleries, videos, and even audio. Several translation files enable you to reach out to international students and calendar widget keeps everyone up to date with most important dates. Along with a responsive design and several stock photos to make your design process easier, University is a great theme to try out. The University theme from the folks over at The Molitor has a rather simple design but don’t let that fool you. The theme packs quite a punch under the hood, allowing you to match your website entirely with your brand and create all the right pages to provide the necessary information about your college. You can provide a detailed explanation of your admissions process and feature members of your staff along with your students and alumni. The theme allows you to choose from unlimited colors and Google Fonts and you can easily promote your latest blog posts or events with a featured slider. Thumbnail images are auto-sized from the images you upload so there is no need to edit them beforehand. The theme also has a responsive design and the ability to promote your social media networks which helps you grow your audience and website traffic. 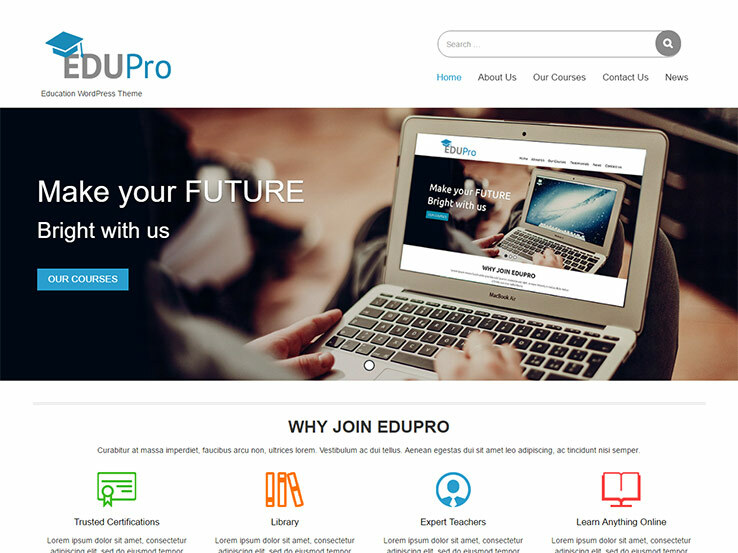 Consider the EduPro theme if you’d like a drag-and-drop designing experience. The theme has a full-screen featured slider which is perfect for sharing promotions and upcoming events or simply latest updates from your blog. Custom icons make it easy to highlight all the benefits of your educational facility and the homepage includes a whole section dedicated to showcasing various courses you offer. Provide testimonials from previous students to build your credibility and easily display your contact information and the address so potential students can inquire about your classes. The theme allows you to upload videos so you can even integrate offline classes for some of your courses and social media integration allows you to grow your social media presence and spread the word about your new courses. The theme options panel has all the settings needed to customize the theme so you can easily change colors, fonts, upload your own logo, and much more. 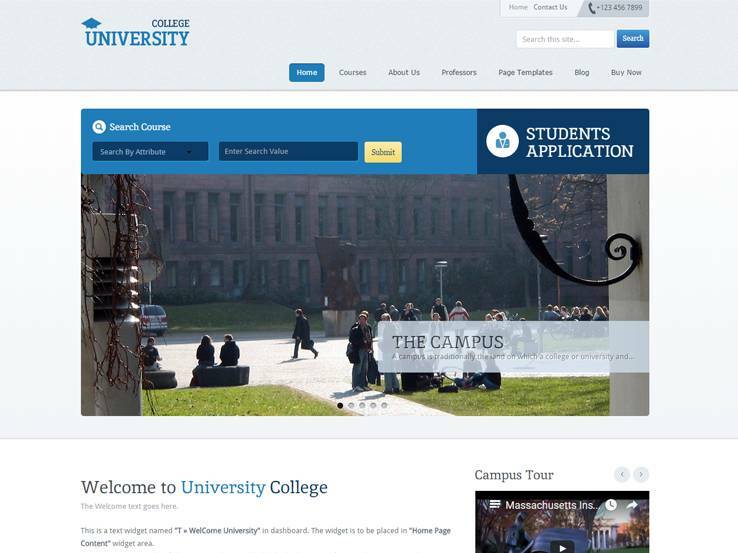 The Flat University theme delivers a clean and professional design for college websites. It looks great on mobile devices, so students will have no problem viewing the information you post on the go. An elegant gallery section provides the opportunity to showcase photos of your institution, while the blog is great for sharing knowledge and updates with your students and other stakeholders. At the backend, the template incorporates lots of customization options. You can upload your own logo and change colors and fonts to match your branding. You’ll also find different post types to add variety in the way you present your information, translation tools if you’d like to localize your website or cater for foreign students, shortcodes and custom widgets to easily display elements on your sidebars and other widgetized areas of your site without coding. 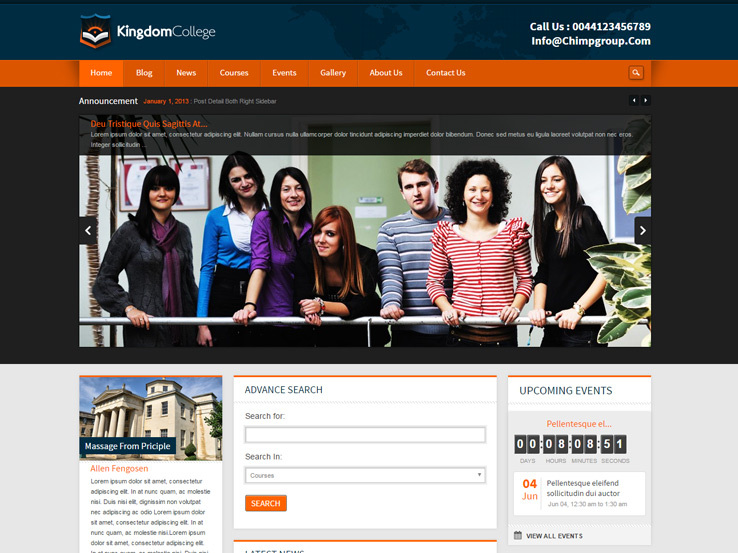 Perfect for college, university, and educational websites, the Kingdom College theme comes with a clean, simple and sturdy design and lots of powerful functionality under the hood. The frontpage has room for your latest news and announcements, latest events and links to other sections like your campus and community pages, and schools and departments. You’ll find a beautiful homepage slider, which is perfect to feature your announcements. The theme includes an excellent events manager that displays your events either in list view or calendar view. The gallery supports both videos and photos, so you can present your facility in interesting ways. Besides, the Kingdom College theme has social media integration and you can also display your contact information at the top. 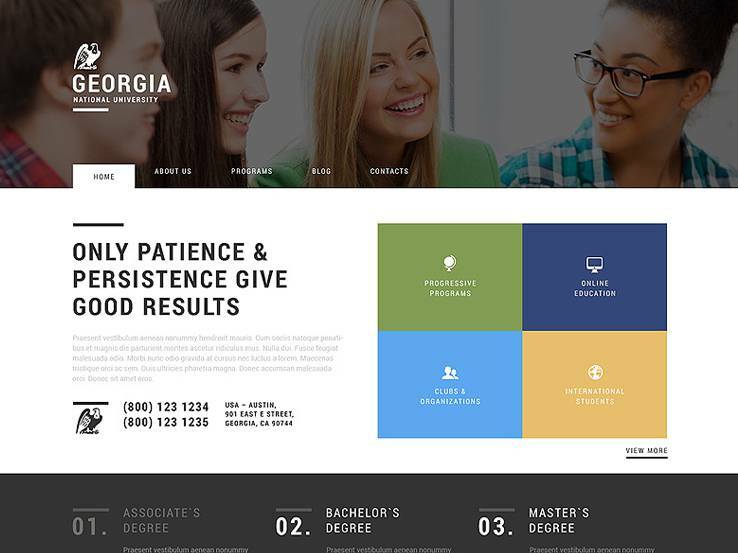 The Education Academy theme is another clean and professionally designed college WordPress theme in our collection. It comes with an advanced course search function that lets students quickly find courses of their interests; they can sort through courses using attributes such as instructor, fees, room no and time. The homepage slider is perfect for featuring your news and announcements, and you’ll also find custom widgets to insert more information on your sidebar and footer. You can display your contact form in the footer, along with your recent blogs and social media feeds, while the sidebar looks awesome with quick links to your important sections, promotion banners, and image carousels. We also like the professors section as it adds to your credibility by showing potential students who their teachers are going to be. 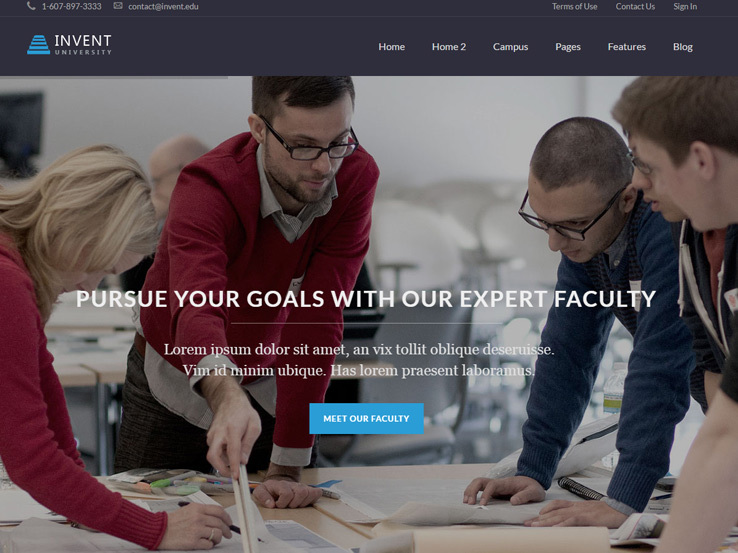 The Invent theme brings a beautiful, modern, and elegant design along with all the features needed to run an effective college or university website. It offers 2 well-thought-out home layout styles to choose from, a fullscreen slider to highlight your important information, a blog for sharing news and other updates, as well as an attractive gallery section to show potential students what your campus has to offer. In addition, you’ll find an events module to promote your upcoming events and testimonials to boost your reputation. There are also other sections to handle your staff information, courses, and departments. Besides, the Invent theme integrates nicely with the WooCommerce plugin, and is translation ready, meaning you can easily reach your foreign students in their native languages. The Lectura theme has a modern and sleek design. Visitors will be welcomed with a stylish frontpage slider upon landing on your website. The slider has overlaying text and a button to drive visitors to your important sections. The homepage is well-organized, with sections to highlight your upcoming events, courses overview, and news and announcements. The theme comes with several page templates to speed up your development work. There are templates for your courses, staff information, testimonials and galleries. Besides, custom widgets make it easy to display the testimonials, upcoming events, galleries and more on your website without coding. The theme can also be displayed in local languages, and the developers offer reliable support, which is great especially if you’re not a technical person. Looking to create and sell courses online? 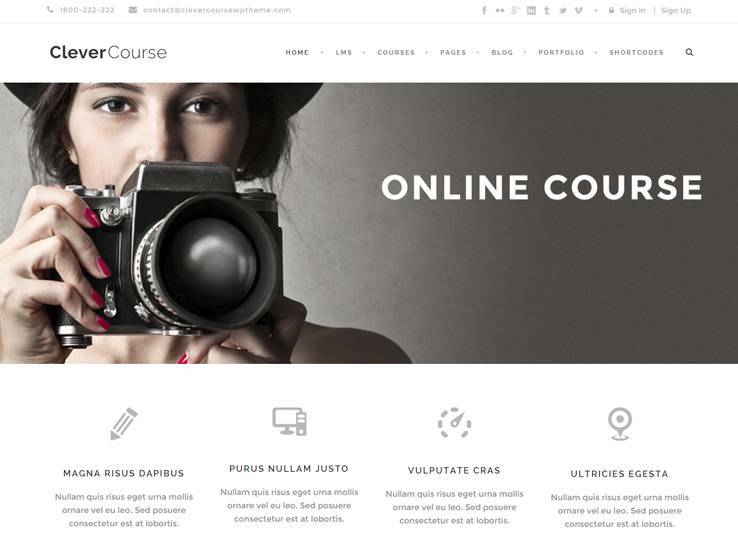 If yes, try the Clever Course WordPress theme. It comes with a learning management system that does all the hard work for you. You’ll have the opportunity to sell your courses online, offer certificates and badges, create video walkthroughs, quizzes, and much more. The backend has sections for students and instructors. Students can easily purchase courses, take quizzes and view scores, while instructors will have their own profile pages. You’ll also find an events module, testimonials to boost your credibility, pricing tables and a blog to help generate more traffic to your website. Furthermore, you can display your contact information at the top along with your social media icons. 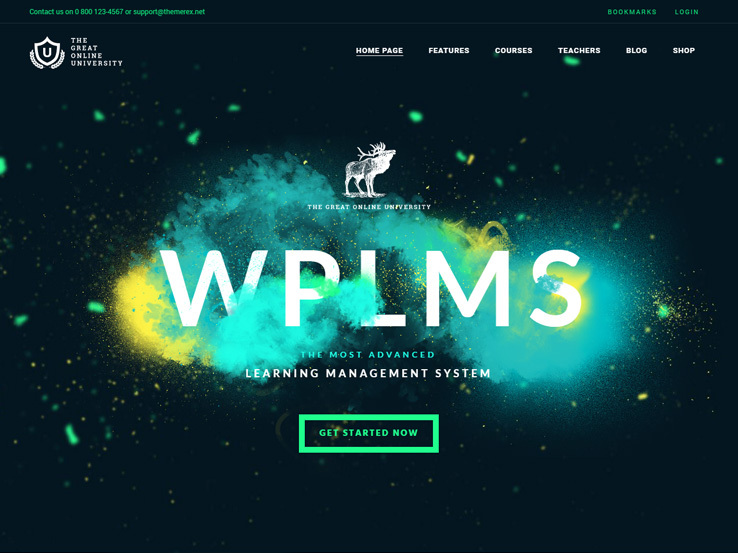 The Wplms theme is a powerful learning management WordPress theme, perfect for those who want to create an eLearning platform similar to Udemy.com or Lynda.com. It has features to manage courses, students, and instructors. Instructors and students will have their own dashboards, and you can easily create courses from the frontend. The courses module has many features including a course directory, custom course pages, quizzes and course timeline. We also like the ability to issue certificates and badges to your students. Besides, the template has an events module, detailed statistics so you can monitor the performance of your website, eCommerce functionality and lots of customization options to make it your own. 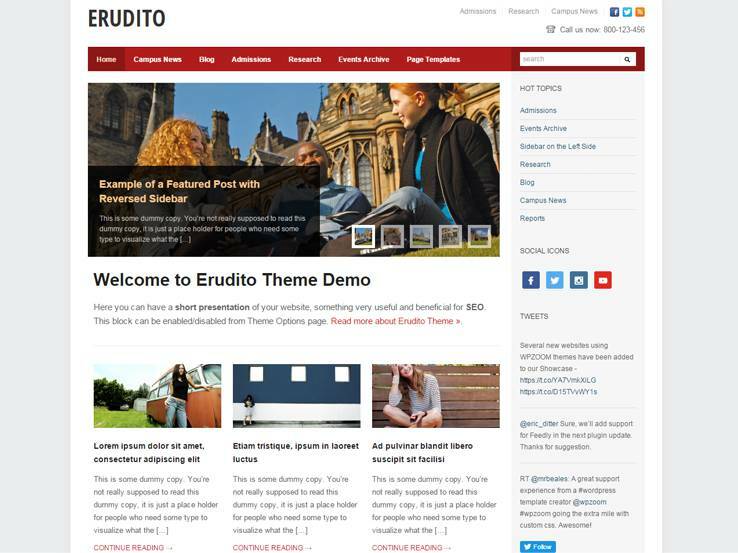 The Erudito theme is suitable for colleges, schools, universities and any other kind of educational website. The theme works perfectly on mobile devices, which is great considering most of your students will be visiting from their smartphones and tablets. The design is professional, clean, and modern. Add your admissions information, upcoming events, college news, research and more. The backend features an intuitive theme options panel from where you can customize your website without messing with code. There’s a dynamic page builder to easily create your page layouts, in-built color styles, widgets, and much more. Moreover, the template integrates nicely with social media, and there’s also a blog that you can use for your knowledge base and to attract traffic to your website. 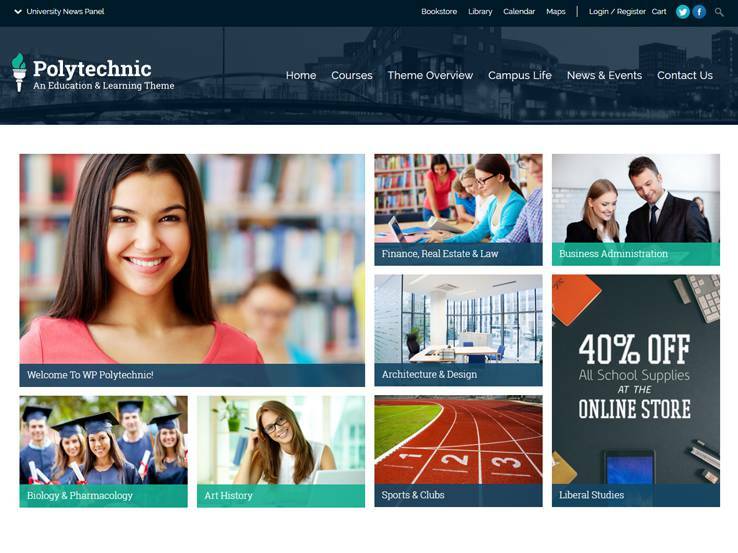 The Polytechnic theme comes with a clean, professional and responsive design that fits nicely on mobile devices. Designed specifically for educational institutions, the theme is packed with a ton of useful features and functionality including faculty user roles with the ability to upload and manage courses, WooCommerce integration to allow you setup an online bookstore, and support for the Event Calendar Pro plugin so you can easily display your upcoming events. Building new pages and adding information to your site will be enjoyable thanks to the drag and drop page builder. Besides, there’s a live customizer that provides live previews of the changes you make in the backend. You can easily upload your logo and change colors and fonts to match your branding. You’ll also find a beautiful blog that you can use to share news updates and gain traffic to your website from search engines and social media sites. 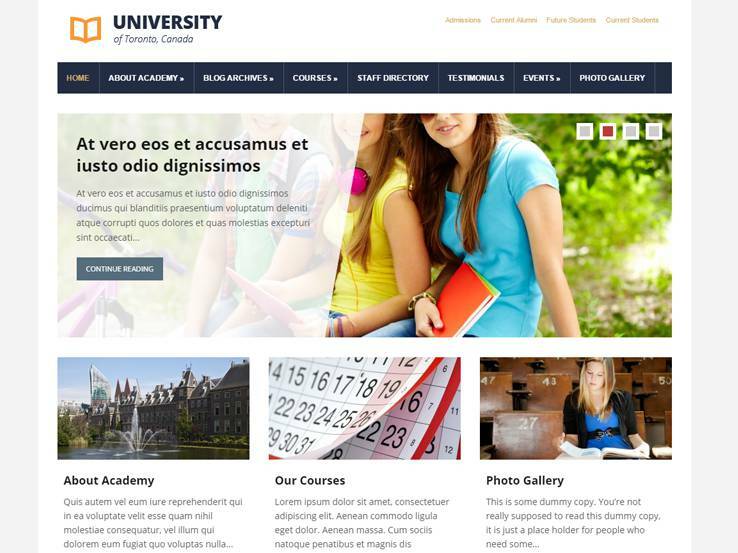 The Uoce theme offers a clean and elegant design along with a range of useful features for educational websites. It comes with a course management system where you can create online courses with their descriptions, features, schedules, pricing options and more. An events module is included for managing your events, and there’s also a gallery to showcase photos of your institution to potential students. The teams section is great for presenting your staff members, while the blog is perfect for sharing news updates and boosting your SEO. Besides, the Uoce theme provides lots of customization options so you can easily align it with your brand. You’ll find different layout styles to choose from, unlimited colors, hundreds of fonts and translation files that make it easy to display your website in different languages. We like the Lacero theme’s clean and well-thought-out design as it makes it easy for your website visitors to find the information they’re after. It features an elegant fullscreen slider on the homepage, complete with overlaying text and links to your important pages. People will have no problem getting in touch with you as they can easily find your contact information at the top or in the footer. The template integrates nicely with social media, which is great considering many of your students and potential students are already on sites like Facebook and Twitter. The course search function makes it easy for students to find courses of their interest, and you can also add student testimonials to boost your credibility. Along with events management, video support, a blog and a newsletter subscription feature, the Lacero theme is a powerful choice you should try. The Online University theme is another great option for building an eLearning platform. It looks attractive and makes it easy to manage your courses, classes, and teachers. Integration with the WooCommerce plugin makes it easy to sell your courses, and you can also display pricing tables. Use the blog to share your knowledge and news, and the gallery to showcase photos of your school. 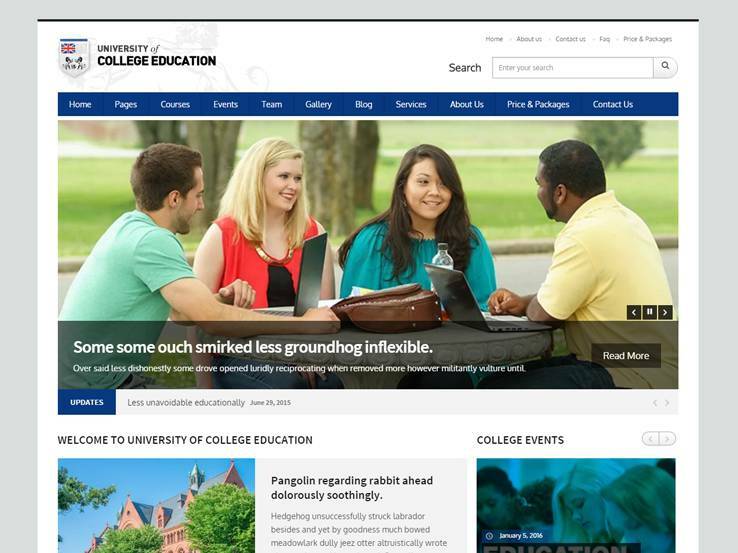 To help jump-start your website creation process, you’ll find several pre-made page templates tailored to universities, colleges, schools, and other educational institutions. Additionally, you’ll find social media icons to help spread word about your school and lots of customization options so you can easily style the theme according to your needs. 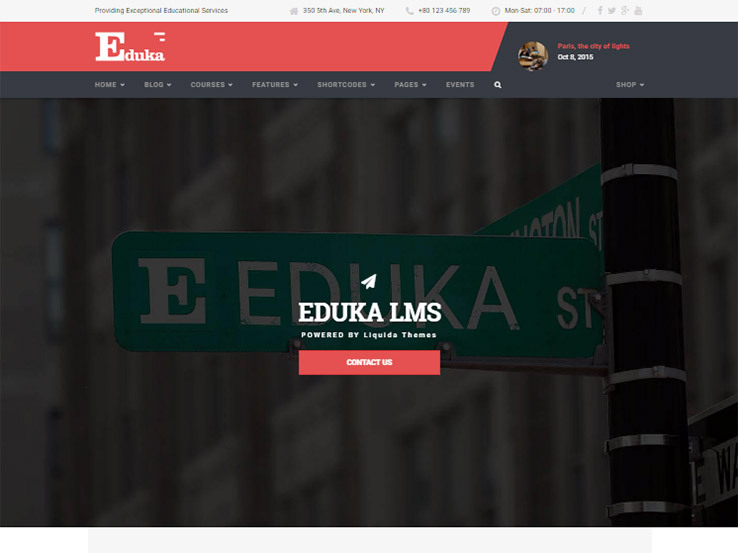 Designed for educational institutions and learning centers, the Eduka theme is a powerful learning management system that makes it easy to manage courses, teachers, staff, and other members. It comes with beautiful course layouts, a fullscreen slider to highlight your most important information on the frontpage, and an events module to manage your events. Choose from 4 different home layouts or create your own custom designs using the drag-and-drop page builder. The included contact form will make it easy for people to get in touch, and you can also add your contact information at the top, along with your location details, hours of operation and social media links. Unlimited colors and typography options allow you to brand your website. Furthermore, the template is fully responsive to cater for users on mobile devices, while the 1-click demo install will expedite your website development process. 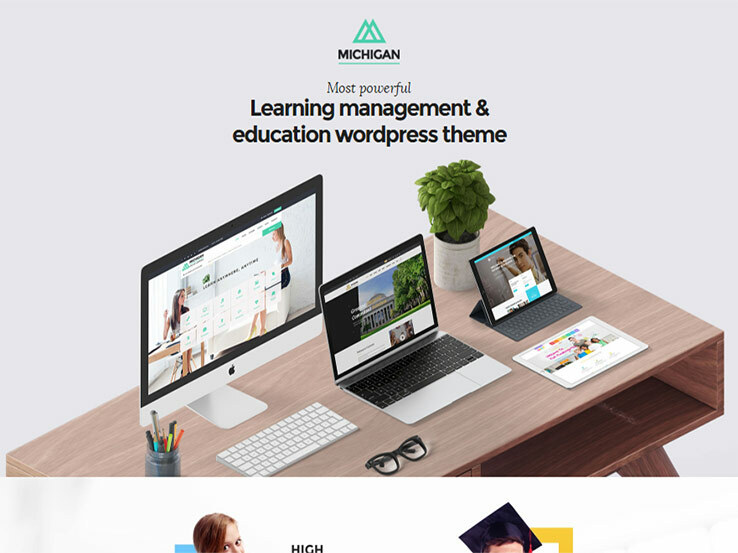 The Michigan theme offers another great option for online learning sites, universities, colleges, and schools of different kinds. It comes with a learning management system along with eCommerce integration, allowing you to easily create, manage and sell courses online. You can also manage your events, or create galleries to show potential students what they can expect after they enroll. Your learning content can include text lessons, videos and audio. Besides, you can issue certificates to students as proof of their achievements, offer quizzes, send emails to students, and monitor the performance of your courses and sales right from your site. Instructors and students will have their own dashboards where they can manage their profiles and other stuff. You’ll also find lots of specialty page templates to jump-start your design process and custom widgets so you can simply drag and drop elements on your site.